In a parliamentary report of 1776, Barton was listed as having a parish workhouse with accommodation for 30 inmates. The townships of Barton-upon-Irwell, Flixton and Urmston originally formed part of the Chorlton Poor Law Union. On 30th October 1849, they joined with the townships of Clifton and Worsley, which were unusual in not previously having belonged to any union, to form a new Barton-upon-Irwell Poor Law Union. Stretford joined shortly afterwards, with Davyhulme, Eccles, Irlam and Swinton being added in 1894. On the original Board of Guardians, Barton-upon-Irwell had four members, Worsley three, Stretford two, and the remainder one. The population falling within the new union at the 1841 census had been 26,316 with townships ranging in size from Urmston (population 771) to Barton-upon-Irwell (10,865). Prior to 1849, a workhouse accommodating 100 inmates had been in operation at Barton-upon-Irwell at Green Lane, Patricroft. Worsley had been running its own local workhouse located to the east of Hazelhurst at the junction of Red Cat Lane and Old lane. 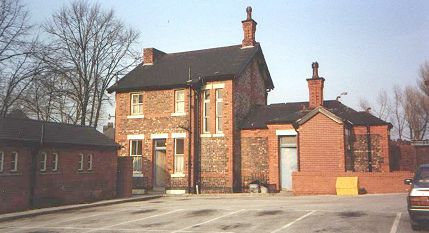 Urmston and Flixton were still using sets of cottages as workhouse accommodation. In 1853, a new Barton-Upon-Irwell Union workhouse accommodating 230 was set up on the Green Lane site. From map evidence, it appears to have incorporated most of the existing buildings. 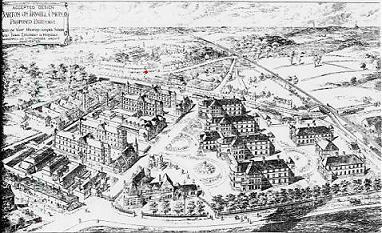 An infirmary was added at the north centre of the site in 1879-80. In 1892-4 a major expansion and redevelopment was planned, following the acquisition of land to the south. The winning design for the scheme by Magnall and Littlewoods of Manchester (below) was published in 1891 featured a large pavilion-plan layout at the north of the site. However, only a much reduced scheme was actually built. The old workhouse buildings at the west of the site continued in use for several years as a temporary infirmary. A Union Hospital was built in 1899-1901 to the north of the workhouse replacing the 1879 infirmary. Barton workhouse proposed new design from the east, 1891. The main workhouse building at the south of the site comprised a central administrative block which also contained the master's quarters. Male inmates were accommodated in the east pavilion and females in the west. Barton workhouse west wing from from the west c.1960. Barton Master's quarters and administrative block from the east, c.1980. The north infirmary wing was used for female patients and the south one for males. A nurses' home stood to the east of the male wing. The infirmary entrance lay at the west side between the two ward wings. Barton male infirmary wing and nurses' home (right) from the south-east, c.1980. Barton male infirmary wing and nurses' home (right) from the south, c.1980. Barton rear of infirmary entrance from the north, c.1980. Barton rear of entrance lodge from the south-west, c.1980. The Union Offices stood at the east of the site between the nurses' home and entrance lodge. The southern part of the building was used as a Court-room. Barton Union Offices and Court Room from the east, c.1980. 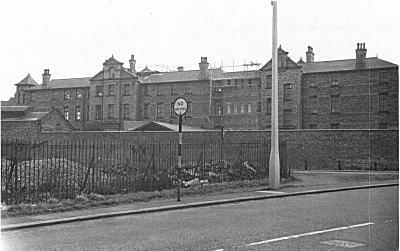 The workhouse later became Green lane Institution, then Bridgewater Hospital. The former workhouse blocks were later used for the care of psychiatric patients, while the infirmary building accommodated geriatric and infirm cases. All the buildings were demolished in the 1990s and housing now stands on the site. 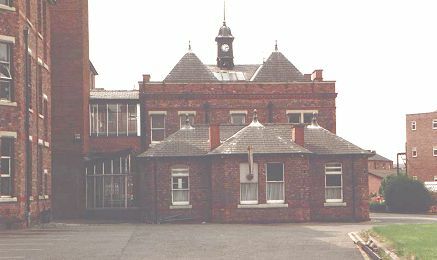 Barton-upon-Irwell erected a new union infirmary in 1925-6 at the north side of Moorside Road in Davyhulme. It was a typical pavilion plan layout with a central administration complex flanked by three two-storey ward pavilions to each side, all connected by a corridor spine. The ward blocks, however, lacked the protruding sanitary towers which were a common feature of earlier designs. The southern end of each ward featured a balcony onto which beds could be placed to provide patients with air and sun. 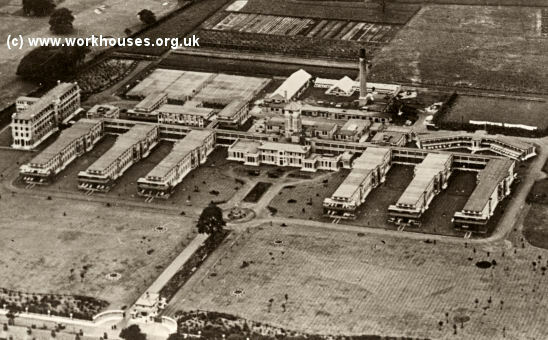 Davyhulme Park Hospital, 1930s, aerial view from the south-east. Davyhulme Park Hospital, 1930s, central administration and ward blocks. The hospital had the distinction of being where Aneurin Bevan, Minister for Health, inaugurated the National Health Service by symbolically receiving its the keys on 5th July 1948. 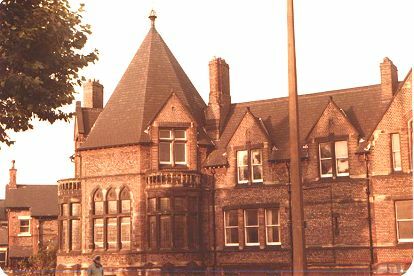 It later became Trafford General Hospital. Lancashire Record Office, Bow Lane, Preston, Lancashire, PR1 2RE. Holdings include: Guardians' minutes (1849-1930); Births register (1868-1928); Deaths register (1909-14); Creed registers (1913-19, 1922-29); etc. The help of Frank Bond in compiling this page is gratefully acknowledged.